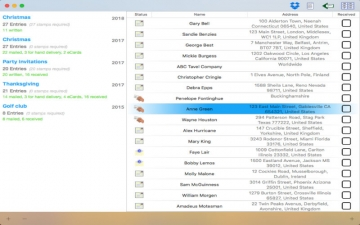 Address Labels | Mac App Storeのアプリ検索・ランキング BuzzMac! 住所ラベル - 分でカード\/メーリング リスト アドレス ラベルを印刷します。非常に簡単に使えるものは何でもあなたの年齢! これは最高のアプリを持っているし、私はどのように格安だったなんて信じられない。長年、私はそれ以外のほとんどのユーザーフレンドリーに持っているように私のラベルを印刷するに苦労しているアプリまで、しかし、CardLists どころか持っているこれまでで最も使いやすいアプリをして私は私のリストを作成し、時間のおそらく 10 分の 1 で私のラベルを印刷Avery のかかった。 素晴らしいアプリ! Address Labels - print your mailing/card list address labels in minutes. Extremely easy to use - whatever your age! Supports a wide range of label sheets including the most popular Avery types. Useful for all sorts of lists - use your imagination. It has been found especially useful for managing Christmas Card lists. Great for home and office. Compatible with the very popular iOS app AddressLabels (formally CardLists) - see reviews below. Use your lists years after year. Personalize your labels with an image, different text colours and fonts. 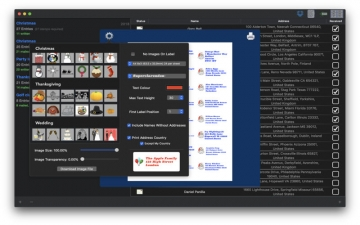 The label image can be the in-app images supplied, or a file from disk, giving great flexibility. 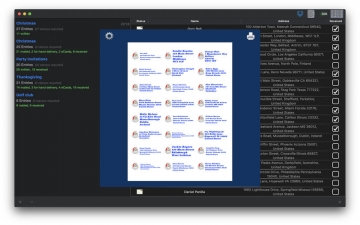 Record the number of cards written, mailed, hand-delivered or sent as eCards. Number of stamps required displayed for each list. 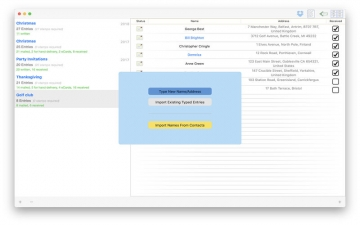 Names can be imported from Contacts or typed manually as required. Names from Contacts can use an alias on the labels e.g. you can import “Mr John Smith” from Contacts, but display and print “John and Mary”, or “The Smith Family” etc. Record when a card/letter has been received. 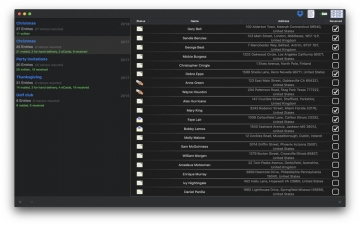 View the history of cards sent and received. You might decide to stop sending to someone who has not replied for a while! Store extra information for each entry e.g. names of children, type of card person prefers etc. My wife has wanted a Xmas card list to remove the tedium of handwriting all the envelopes and I had shied away from it on the grounds of it would be more trouble than it's worth. WRONG! Did some research, came across this app, read the reviews and thought it must be worth trying. I have been bowled over by how good it is....so easy to create lists and print the labels.....it worked first time and the joy of seeing all the addresses perfectly aligned with the labels inspired me to create lists for other groups of friends and colleagues. Used to have an old Easymail software on my PC, which was very good and easy to use. Now on iPad tried all manner of so called labelling Apps. Most were either glitchy, did not do what they said or were very difficult to use and more hindrance than help. So finding this has made my day utterly. Very good App and seems to have all bases covered. Managed my Xmas list with ease. I made and entered a new list from scratch and it was easy to manage and printed to my Avery labels perfectly. oh and the help site is excellent too. This has got to be the best app I have ever bought and I can't believe how cheap it was. For years I have struggled with Avery to print my labels as it has got to be the most non user friendly app ever, however, CardLists on the contrary has got to be the most user friendly app ever and I created my lists and printed my labels in probably a tenth of the time it took me with Avery. Marvellous app !